Since the beginning of the year, my training has been pretty sporadic and I really haven't been as motivated or consistent as I need to be. I had a couple of slow marathon runs, then my attempt at the cross country marathon where I DNF'ed and injured my knee, 9 days totally off running, a weekend of sickness...it really wasn't the best preparation for a 45 mile self-navigation cross country run on a freezing Sunday in February. 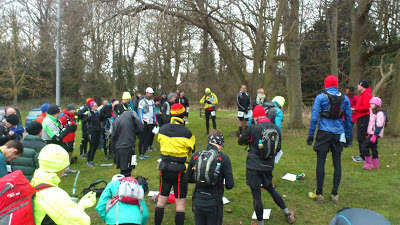 As a result of all of this, I really was in two minds as to whether I should turn up at all to run the St Peter's Way ultra on Sunday, Challenge Running's second event after last year's Stort 30...you know, that race where I was first lady ;) Anyway, I thought that marshalling was probably a much better option than trying to run for 45 miles only to get another DNF, which would sap my confidence even further. But I bought my new Salomen's, just in case, and kept thinking about everyone who was expecting me to be there and how many people at work I'd told I would be running the distance! As silly as it is, I was also thinking about my bio on twitter and my blog - I call myself an ultra runner, and I really need to run some ultras if I'm going to let myself keep that title! However, because I wasn't 100% committed to taking part in the event, I didn't properly prepare in the days leading up to it - I wasn't running because my knee was still hurting (but I suppose we could call that tapering) and I wasn't carb loading because I'm still trying to lose weight for the wedding. I wasn't drinking enough, I didn't even manage to sort out my kit or pack anything on Saturday, and after watching far too much of a film, didn't get to bed until after midnight...and then had to get up again when I realised that of course I was running in the morning, who was I kidding that I was going to pull out or marshal, but I still had to charge my Garmin, which I incidentally couldn't find, so charged up my old 405CX instead! As soon as I arrived at the start, I totally relaxed into it as I saw so many runners I know. I met a couple of people I'm friends with online for the first time in person - my mentor Jerry Smallwood, who's supported me through massive changes in my running in the last couple of years (and who was sweeping the event with the lovely Allan Rumbles, who I consider my other mentor) and also met Morgan Pinkett who lives in Billericay too, and who's been a friend on twitter for a while now. It definitely makes a difference to meet people in real life! After sorting out numbers, dropping off bags and listening to the quick briefing from Race Director Lindley, we were all ready to go. I'd made my excuses to everyone about how I was going to get to the marathon distance, and then decide whether I was going to continue or drop out. People nodded heads, and agreed I should see how I got on...little did I know there was a conspiracy brewing to make sure I didn't drop out unless I absolutely had to - Lindley knew my head wasn't in the best place and that was going to be the biggest risk to my finishing. With a couple of seconds to go, I suddenly remembered my Garmin was still in my rucksack....as organised as ever! I scrabbled about trying to get my rucksack off, the watch on, the rucksack back on and the Garmin set-up to find satellites....and then we were off. I was at the back of the pack (where I pretty much stayed for the whole day!) but I was there, and running my second long distance ultra. 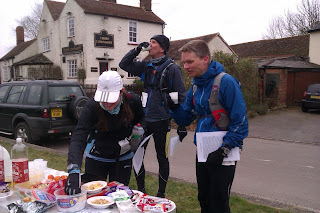 I was running with Conrad Wild, who I know through twitter but who I also ran with for 10 miles or so at the Stort 30. We had talked before the race about running together, and I was pretty worried about it, as I knew I wasn't particularly fit for the distance, and didn't want to hold him back. As we got to the first ploughed field and he bounded over it like some mountain goat while I walked tentatively over the rough terrain, I was even more concerned, especially when I saw he'd waited, but stay with me he did, and I will be forever grateful! The field quickly spread out, and most of the runners in front of us disappeared from view before too long. Conrad and I were a bit perturbed - I was happy with our conservative pace and we were keeping pretty much to plan, but everyone else just seemed to be very fast - a great field of runners indeed! We plodded on though, enjoying ourselves and following the instructions which were, by and large, very clear. A few detours, and moments of confusion, even getting a bit lost a couple of times but to get us to 45 miles for the race, we had to built in a bit of extra distance, as if you followed the SPW properly I think it's only 42 miles or so! My knee wasn't great, and at the first checkpoint I'd put on my support, and at the second, rubbed in some ibuprofen gel to try and alleviate the pain. Got to say that the food provision was excellent at the checkpoints - I was very impressed! I really felt for everyone who was manning them though - it was bitterly cold and I can't imagine how unpleasant it must have been standing around for hours waiting for us runners at the back of the pack. My appreciation for marshals grows with every event I do!! By the time we were getting close to the third checkpoint at just before 26 miles, I'd started talking to Conrad (and Ralph, another runner who we'd picked up) about dropping out because of my knee. It hurt, but not enough to stop me running, but I was worried about how I was going to manage to finish...it's true, it's all in the mind! I just kept thinking about how on earth could I tell people at work I'd dropped out of another race, about how I wouldn't get to have that amazing medal that Lindley had sorted out, how I'd have failed...again! But I wasn't convinced that I had the strength to keep going and was scared of it turning into an absolute disaster. As soon as we arrived at checkpoint three, I had a big hug from Karen, whose first words were "Lindley told me I'm not allowed to let you drop out". There we go then....the decision had been taken out of my hands, and to be honest I was relieved. I didn't have to think about it any more - I was going to finish this event one way or another and that was that. We stood chatting for too long, enjoying Karen's baking and the still impressive food selection that was available, but started to get cold and stiff and on suddenly realising, we were quick to get moving again, leaving Ralph with his wife, and the peanut butter sandwiches and tomato soup she was transporting to every checkpoint for him! He soon caught us up though. I don't remember much about the details of the actual run to be honest....it was straight across lots of barren fields in a bitterly cold wind that felt like it was searing your skin, through paddocks filled with "possibly friendly" horses according to the race instructions, clambering over too-high rickety stiles, along tree-lined tracks, over a gate into a sheep pen, pushing through hedges and at one point we were jumping across a stream - maybe this was one of the bits where we were lost? Not sure, but it really was all a great adventure and I loved it. There were centuries old churches, quaint villages, a Sunday morning football match, and I remember the stupid woman with her rat-like mini dog on a long lead that jumped up at me trying to bite my knee at some point in the day. I think it got a mouthful of my knee support instead. "Oh, he doesn't usually do that...it's because you're running" she told me. The last section was a bit different as we got to the coast. The farmer's fields gave way to marshes, mud-flats, flocks of geese, and the boats in the harbour. The latter part of the race was definitely the most agonising time I've ever had as the pain in my knee went from occasional stabbing each time I bent it, to a bread knife being permanently embedded and twisting in the bottom of my knee cap each time it moved. Had Conrad not been determined to keep us to a schedule of running (25 minutes) and walking (5 minutes) and timing us through it, I think I could have walked the rest of the way. He did relent when I was noticeably limping as I walked, and we ran 5, walked 5 until I had worked out how to deal with the pain and we could carry on running properly. Reaching the sea wall was a real marker for me. 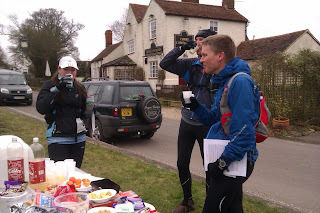 We were nearly at the finish which 20 miles ago had really been inconceivable and that was a massive boost. The light was waning and I wanted to finish without the torch, but didn't manage it - it quite quickly seemed to get very dark, and in the end I was too worried about missing my footing and falling over the edge! So, light in hand, buff pulled up over my face, head down, desperately ignoring my knee, the wind and the bitter cold, and willing Conrad on through the pain he was suffering, onwards we went for the last few miles. We were going to complete it. Running towards our destination of the St Peter-on-the-Wall chapel seemed to take an absolute age - you can see it from miles away but it just didn't seem to get any closer. All of a sudden though, the directions sent us down a bank, round the corner, and that's the finish! There was a building, but it was shrouded in darkness and apparently deserted, so we weren't 100% certain we were in the right place! We ran over to the closest wall and suddenly came across the finish sign flapping in the wind....that icy, biting, hypothermia inducing wind that we'd been running through ;) I couldn't believe we'd finished but indeed we had. Before too long we were inside the chapel, being congratulated and having more food. Got to love an extra checkpoint at the end of a race to refuel! :D We'd taken 10 hours and 7 minutes - longer than I'd hoped for, for the distance, but in the circumstances, I'm happy with our time - the cut off was 13 hours so we were well within that. There's no electricity in the chapel, but a few of us had headtorches so there was some light, and it was pretty atmospheric. It's really ancient - built on the ruins of a Roman fort by St Cedd in 654AD and doesn't seem to have changed much since then. 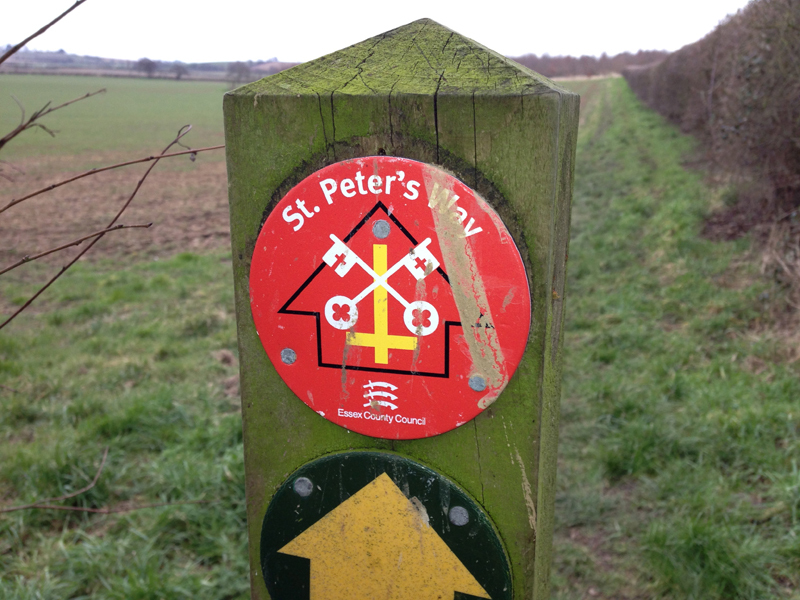 Since it was built all of those hundreds of years ago, St Peter's chapel has been a site of pilgrimage to many, as now it was to us - we might not have been on a religious journey, but it was certainly one of self-discovery and dedication! I'd phoned Francis at the last checkpoint, and by the time we'd got ourselves changed and sorted out, and then trudged up to the car park a mile along a muddy track from the chapel, he was waiting in the warm car. We gave Conrad a lift back to the start where he'd left his car....and then it was done, all over, and you know what, I'm not sure I've ever felt more pleased with myself after an event, except perhaps my marathon PB race...because for the first time, I felt like I'd run a real ultra. The 52 miles I did in July was a safe event, really closely managed, and laps of 6 miles each. The St Peter's Way race was totally different - I had a rucksack, I had to carry provisions, I had to follow directions, it was absolutely bloody freezing, and I was in a world of pain for a lot of the distance, and I certainly wasn't very well prepared for it. But I finished. Although this was, in part, down to sharing the hard work with Conrad and for some of the way with Ralph, and to the support from Lindley, Sue, Karen, Jerry, Morgan, Allan, the other marshals....it all made a real difference. I don't think I could have done it on my own, and I'm hugely grateful I didn't have to try. Great race report Naomi and well done. You almost make me want to run this....almost! It's amazing how such a painful experience can be so rewarding, but maybe that captures why we run. Well done on finishing. How were the new Salomons? I love seeing these runs from another person's viewpoint...I had forgotten about Karen's scrumptious baking, I sneaked a couple more when she wasn't looking. Rest up and come back stronger.